Not everyone is a big person. I myself am not. Not these days, anyway. But heavy people, too, need mattresses. 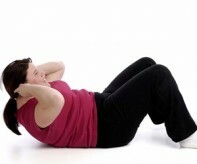 So what the best mattress for a heavy person should be? What’s a mattress for heavy people? A mattress for heavy people is not something that is supposed to be helping to treat whatever weight-related conditions they have. Granted, there are special beds with special traits like this one, ones that would help to alleviate some illnesses, but we’re not talking about them. Not, what we’re talking about is the support. Speaking of limits, there are several thresholds to speak of. The lower threshold in this instance is the lowest weight of the sleeper that guarantees a comfortable sleep. Very real, too, especially with memory foam. Too lightweight a person might experience severe discomfort. Why? Because the foam would fail to react to their weight, no giving in enough. This is subjective. The point, however, is self-explanatory. Weight-wise, the comfort zone is a “span” of all weights that guarantee the best comfort for the sleeper. In short, it’s the optimum. 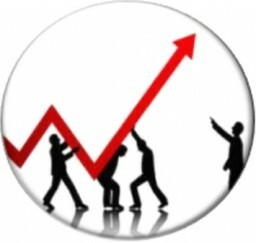 The higher threshold is, as you can guess, the highest weight of a person that can yet be supported properly. 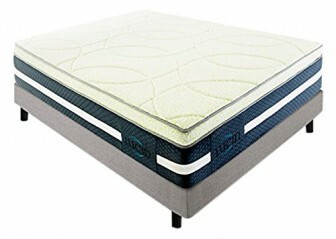 The sleep on a mattress when your weight is below the higher threshold is still comfortable. Self-explanatory. When the mattress cannot handle the sleeper’s weight and just breaks under them. Sometimes, people feel uncomfortable even before that happens. Sometimes, the breaking point and the higher threshold are the same. That depends on the mattress. Where did you stumble on that classification? I did not. I simply invented it. Granted, it’s not as good as what a scientist would come up with, but hey, it’s practical, and that’s all that matters. Of course, it’s different for different people. And different types of mattresses, too. After all, they all perform differently. 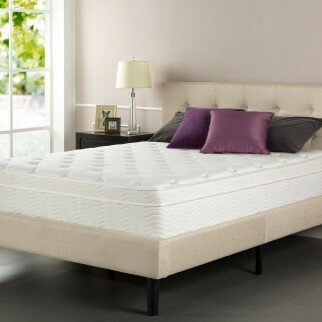 Memory foam mattresses, latex mattresses, innerspring mattresses, even the best air mattresses. And they all can be suitable for heavy people. Air mattresses for heavy people? Really? Indeed. But of course, that depends on how heavy we’re talking about. Some air mattresses are only good up to 300 pounds. Some would do well up to 600 pounds. But there are people heavier than that. So, perhaps, they are suitable for many. Just not for everyone. A good mattress for a heavy person should be firm, regardless of the technology employed to make the mattress, but not quite firm. Suffice to say, the mattress should have medium firmness level. The reason for that is simple. The “support” part might seem obvious, but the thing is, it’s the edges what makes it important. Especially with pocketed coils. They tend to be perfect for distributing your weight evenly, but when it comes to sitting on the edges of the mattress or even merely moving closer to them in your sleep, they just collapse! This is easy to explain. When you lie at the center of the mattress, your body contacts more coils, and each one has relatively less of your weight to support. But once you move closer to the edges, the moment some part of your body does not contact the mattress anymore, the pressure increases. Not too much of an issue with lightweight people, but with heavy people this might make matters a little uncomfortable. That is why you should be looking for a mattress with edge support. It’s obvious that heavy people need thicker mattresses. But why exactly do they? How to explain that besides using the “it’s obvious”? The reason for that is that the extra pressure a heavy person creates compresses a thinner mattress to the point they can feel the ground or the platform. If the mattress is thin but firm, they may never hit what’s underneath, but the compressed thin mattress would not be much better. 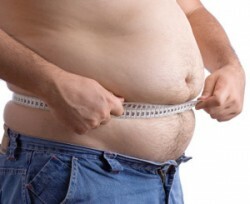 I estimate that heavy people (300 pounds and more) need at least 13 inches. That’s if we’re talking about conventional mattresses, it’s simpler with air mattresses since they usually have to mark about how much weight they can handle. Heavy people’s skin area is much bigger than it is with lightweight people. Due to that, the area of contact of the skin with the mattress is also much wider. This fact easily interferes with natural heat exchange (to say nothing of how heavy people tend to suffer from overheating in general). This is why it would be better for heavy people to sleep on mattresses that offer to cool in one way or another. Let us open this top five list with this air bed. If I were to judge it on the supportive qualities alone, I would give it a better place, if not the first. But as it is, I’m judging the mattresses on how suited for different categories of people they are. Air mattresses as a whole are not suited for long-term usage. Even if this particular mattress is, that’s only compared to other air mattresses. And that is why I cannot in good conscience give it a better place. 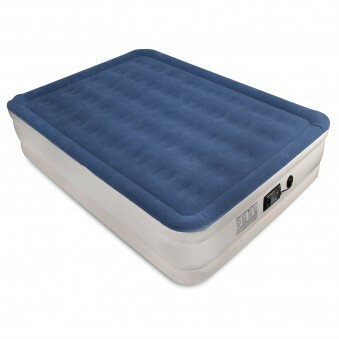 It is capable of supporting up to 600 pounds, but it is an air mattress, one that can be damaged relatively easy and is meant for a limited time of use. And it’s not well-suited for camping since it requires an outlet for inflation, and no external pump can be used. Well, at least it comes with a built-in pump. In short, this is a perfect guest bed for heavy people. The mattress is very cheap, and that’s another nice thing about it. Yet another good thing is that it’s puncture-resistant, although I wouldn’t test it on purpose if I were you. If you don’t like how this mattress is unsuited for camping, make sure to check out my reviews on air mattresses. There are some that, too, can handle up to 600 pounds, and some of them can be used with an external pump at the very least. But if this mattress specifically sounds okay to you, you can order it on Amazon.com. 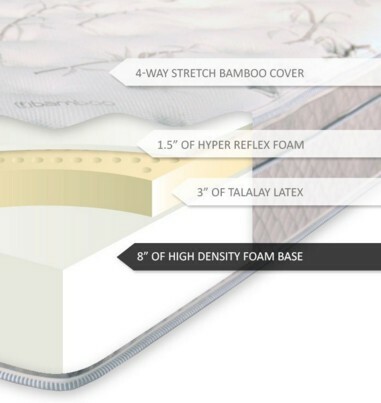 This sixteen inches thick hybrid memory foam/latex mattress is a good choice for heavy people because of its height alone. Sixteen inches is a lot. There aren’t many mattresses this thick unless they are air beds, but that’s different. The mattress comes in six sizes: Twin, Twin XL, Full, Queen, King, and California King. The two memory foam layers are on top of the latex layer, which is used to provide you with supple support, specific to latex. 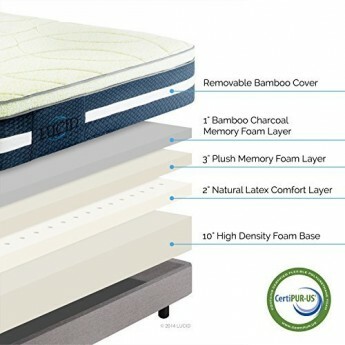 The top memory foam layer is infused with bamboo charcoal. It is used to absorb unpleasant odors and is hypoallergenic. The mattress is very heavy due to its height is thus it’s rather hard to move around. 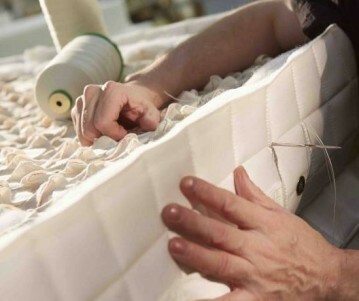 Another issue is that the memory foam requires unobstructed contact with your body to work properly. Otherwise, it might fail to react to your body heat and soften. That would lead to a less than pleasant sleeping experience. But that also means that the mattress is not exceptionally hot. Not quite the same as gel-infused memory foam, but close nevertheless. But I still don’t recommend getting a thick topper or protector for it. Otherwise, I don’t expect you to have any issues with it. You can order this mattress on Amazon.com right now. 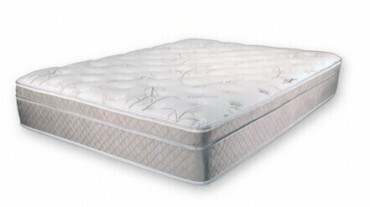 A perfect innerspring mattress for heavy people. You see, this mattress has a medium feel to it. Precisely what’s ideal for people who weigh more than 250. That alone makes it good for them. But then the height of the mattress is 13 inches. A little under half of that height comprises the pressure relief comfort foam layer. That’s right, the comfort foam layer is about 4.5 inches thick. 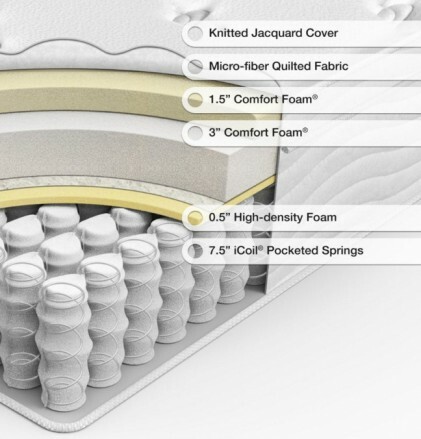 Add to that the .5 inches of high-density foam, the coils system 7.5 inches high, and the quilted cover, and you’ve got the idea of what this mattress exactly is. But while the mattress is good heavy people, it might not so good for very heavy people. If I were to estimate the maximum weight it can handle, comfortably so for the sleeper, I would go for 300-350 pounds. Of that I’m sure. Any more than that? Well, it would still hold you, perhaps even comfortably, but soon enough the mattress would simply wear down. And that’s not something you want to happen to your long-time investment. As expected from pocketed coils, they eliminate motion transfer and provide perfect support. The issue with them is that the edge support is not enough. 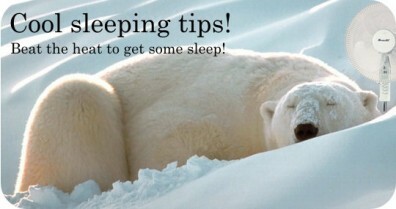 If you don’t tend to move close to the edges in your sleep, that shouldn’t bother you. You can order this mattress on Amazon.com and never again worry about back pain or overheating at night. But if you do move about a lot, perhaps, you should consider other options. The mattress should be opened as soon as possible. It wouldn’t do well to leave it unopened for a long time. After all, the coils might suffer some permanent damage. Not quite as thick as the other mattresses, this one is still great at doing its job properly. Twelve inches thick. Still, it’s suitable for heavy people, just not as much as, say, 13 inches. However, this is latex. And latex is known to be rather firm and supple. It does not go all the way down when you lie on top of it, and that’s how it is suitable. 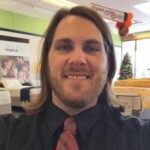 The mattress is custom tailored, which might not exceptionally good for heavy people specifically, but still is good for customers regardless of their weight, height and such. The mattress comes in 6 sizes: California King, Full, King, Queen, Twin, and Twin XL. That is more than enough for most bed platforms. The mattress is very light, which is certainly a boon since it makes it rather easy to set up. It comes with a Eurotop zipper cover. Very pleasant to the touch, the mattress is much cooler than your typical memory foam mattress. No heat traps, which is handy, if you ask me. And, of course, since it’s a latex mattress, it is anti-microbial, mold- and mite-proof, and hypoallergenic. You want to buy it, don’t forget to follow this link to Amazon.com. And the first place to this latex mattress! It’s not just suitable for heavy people, like every other mattress in this top list, oh no, this mattress has been designed for them exclusively. As you can see for yourself, the upper limit is 400 pounds. This mattress would not perform well for lightweight people, it is a product for the overweight only. But for them, it is a perfect choice. The best mattress ever, if there is any. So, what exactly is Comfort Max 400 like? First of all, it has a layer of Talalay Latex 5 inches thick. 5 inches is a lot as far as latex mattresses go. But that’s not all. Secondly, there is a layer of UltraCell High Resiliency Base Foam, also 5 inches thick. Together, their height is exactly 10 inches. This might be considered not enough for a mattress for heavy people, but not with this item. After all, it was designed for them. The catch is the support foam. It performs better than most types of foam with similar qualities. And that is why the mattress can be so (relatively) thin and yet so supportive. The mattress comes with a luxurious Micro-Lux cover. But what’s more important is the fact it comes with additional edge support. I can’t stress enough how important that is. If you want to have this magnificent mattress, then who am I to stop you? 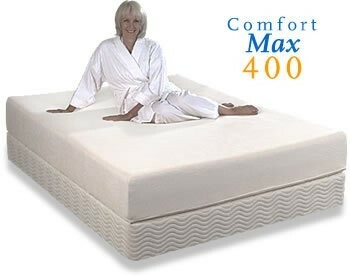 Just follow this link and order your very own Comfort Max 400 on Amazon.com. As you can see, not one of these mattresses is simply memory foam. The only one that does have some memory foam is a hybrid latex mattress. That’s no coincidence. Memory foam tends to be very hot to sleep. Gel makes it a bit easier, but still, the only memory foam mattress to enter this top does not exchange heat just as easily as many other memory foam mattresses. 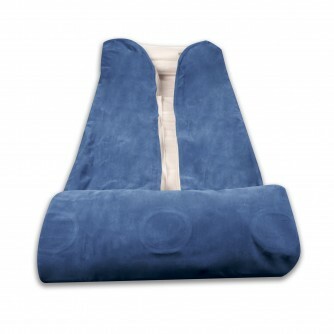 The air mattress, by the way, would be very cool to sleep on, as long as the air temperature is low as well. Any air mattress is like that. That is so due to the fact the very easily exchange heat with the air. As for what exactly you should be choosing… That fully depends on your needs. 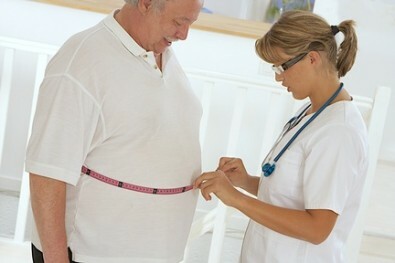 I am Peter and I have a health condition and I need a firm mattress and I weight around 265 pounds . Each morning I wake up with pain because all night long the matress compresses and catches my back disc and I also hear the coils and the matress is too hot .me and my wife need a good matress to have a Good sleep. My wife weight 190pounds.Will you please help us with information. Apparently you need a thick latex mattress, preferably a Dunlop one. Talalay is too soft, I wouldn’t recommend it for anyone who both suffers from back pain and weighs more that 200 lbs. Hopefully, you are not allergic to latex specifically, some people are. A good solution would be to get two separate mattresses. You can still put them into the same bed, provided their sizes are compatible. Some blow-up mattresses can hold a load of up to 600 pounds but those aren’t exceptionally good for anyone’s back. The Comfort Max would work for you and, practically, for you and your wife, but I would not recommend that because you’ll most likely loose your warranty, even if you exceed the limit by 55 pounds. I am a large guy at 350 lbs and 6’4″ and I sleep “hot”. All of the normal Big Guy sleep issues. I bought a HD coil spring mattress that I thought would work for me, but unfortunately it does not provide the right support. I read the reviews online, but I am a little gun shy at this point. Any suggestions? The best way to be sure would be to check out a mattress in a real-life store. It is one of the advantages they do have. Otherwise, well, I know too little of your situation. Are the coils made from a titanium alloy? 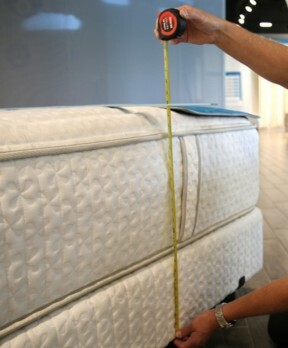 How tall is the mattress? Things like that. As it is, the only thing I can actually recommend is to get either a taller mattress or, perhaps, a dedicated mattress for heavy people. I know this wasn’t really helpful but I do hope it might be. Next What’s the best soft mattress for someone with a back pain?